Scheme of Jurkat dual TCR model. To what extent TCR mispairing is addressed successfully by TCRαβ:ζ was tested in dual TCR T cells, representing the end-products of TCR gene transfer. To this end, a Jurkat T cell clone expressing MelanA/HLA-A2 (MelA/A2) TCRα12β27 as a first TCR was gene transferred with TCRα19 plus β9 or TCRα19:ζ plus β9:ζ as a second TCR. Second TCRs were specific for either MAGE-A1/HLA-A1 (M1/A1 as indicated in figure), gp100/HLA-A2, or EBNA4/HLA-A11. M1/A1 TCRαβ:ζ does not mispair with MelA/A2 TCRαβ and shows high surface expression on T cells. A, Jurkat T cells expressing MelA/A2 TCRα12β27 were transduced with a second M1/A1 TCRα19β9, or their individual TCRα19 or TCRβ9 chains. The TCR transductants were monitored for expression of introduced M1/A1 TCRαβ using flow cytometry with anti-TCRα19 and Vβ9 mAbs (upper panel, second TCR). The expression of MelA/A2 TCRαβ was monitored using anti-TCRVβ27 mAb (lower panel, first TCR). Filled gray histograms correspond to background fluorescence of T cells stained with isotope control Ab. B, Jurkat T cells expressing MelA/A2 TCRαβ were transduced as described in A but now using M1/A1-specific TCRα19β9:ζ chains. Flow cytometry was performed as described in A. Please note that flow cytometry settings did neither allow for full compensation of autofluorescence (high for the TCRneg Jurkat T cells clone used in the study) nor for “bleedover” from one channel to another, especially evident from FL2 to FL1 channels (due to enhanced sensitivity of PE-labeled over FITC-labeled Abs). Background signals never exceed 5% of the total T cell population. Data represent one of four independent experiments with similar results. TCRαβ:ζ, but not TCRαβ, coexpresses with TCRαβ in dual TCR T cells. 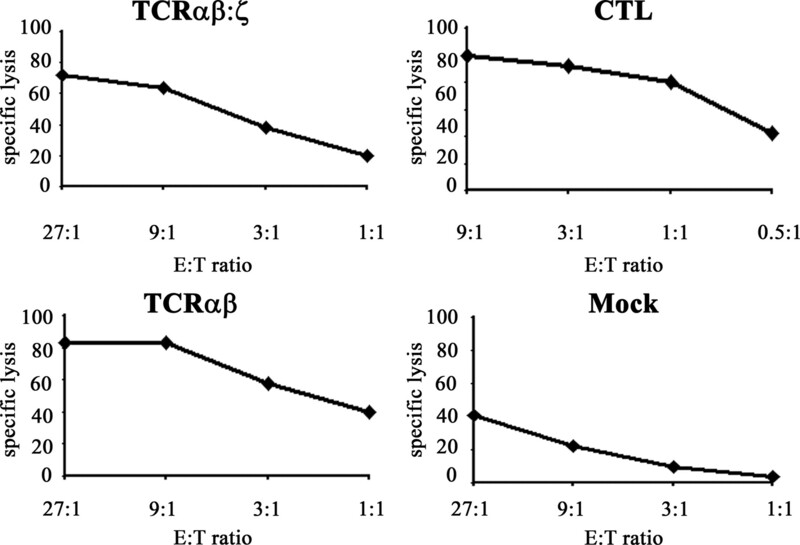 Jurkat T cells expressing MelA/A2 TCRαβ (i.e., TCRα12β27) were transduced with a second M1/A1 TCRαβ or TCRαβ:ζ (i.e., TCRα19β9) after which T cells were enriched by FACS using anti-TCR-Vα19 and TCRVβ9 mAbs and analyzed for coexpression of MelA/A2 and M1/A1 TCR using flow cytometry. Double immunostainings of T cells were performed either with FITC-labeled anti-TCRβ27 mAb and PE-labeled M1/A1 multimers (upper panel) or FITC-labeled anti-TCRα19 mAb and PE-labeled Mel/A2 multimers (lower panel). 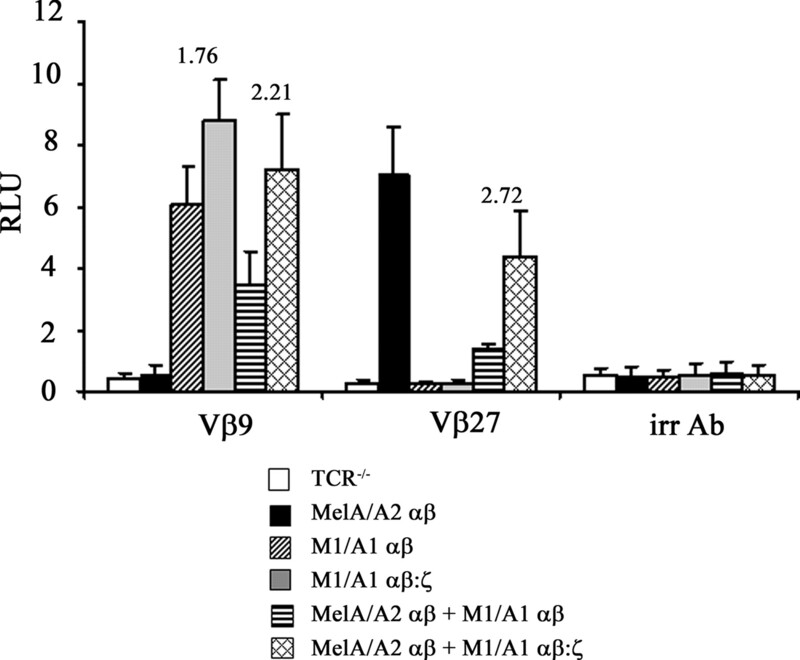 Numbers indicate either percentage of M1/A1 multimer-positive T cells (set to 100%, highlighted by a black rectangle) that costain with anti-TCR-Vβ27 mAb (upper panel) or percentage of anti-TCR-Vα19 mAb-positive T cells (set to 100%, highlighted by a black rectangle) that costain with MelA/A2 multimer (lower panel). Data represent one of two independent experiments with similar results. TCRαβ:ζ chains do not mispair with TCRαβ chains, irrespective of Ag specificity. MelA/A2-TCR Jurkat T cells were transduced with TCRαβ or TCRαβ:ζ specific for either M1/A1, gp100/A2, or EBNA4/A11 Ags, and the level of surface expression of the MelA/A2 TCR was monitored with flow cytometry using either (A) anti-TCR-Vβ27 mAbPE or (B) MelA/A2-multimerPE. The bars represent the percent of positive cells and show mean ± SEM of three independent measurements. ∗, A statistically significant decrease compared with the Jurkat T cells expressing MelA/A2-TCR only (single TCR T cells, first bar) based on Student's t test (p < 0.05). 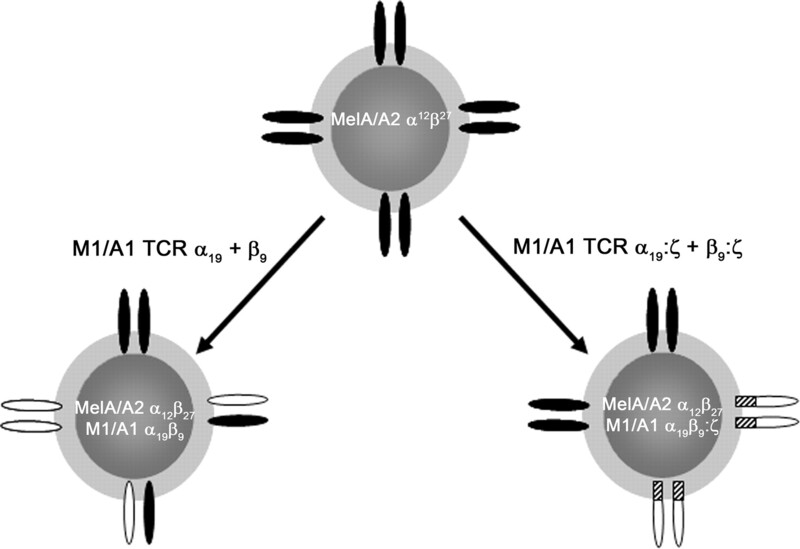 Highly preferred pairing between TCRα:ζ and β:ζ but not TCRα and β in dual TCR T cells. Jurkat T cells expressing either M1/A1 TCRαβ or TCRαβ:ζ in the absence or presence of MelA/A2 TCRαβ (i.e., single and double TCR T cells, respectively), previously enriched by FACS with anti-TCR Vα19 and Vβ9 mAbs (specific for M1/A1 TCR), were stained with donor- and acceptor-conjugated anti-TCRα and β mAbs and analyzed for FRET efficiency using a FACSCalibur dual-laser flow cytometer as described in Materials and Methods. 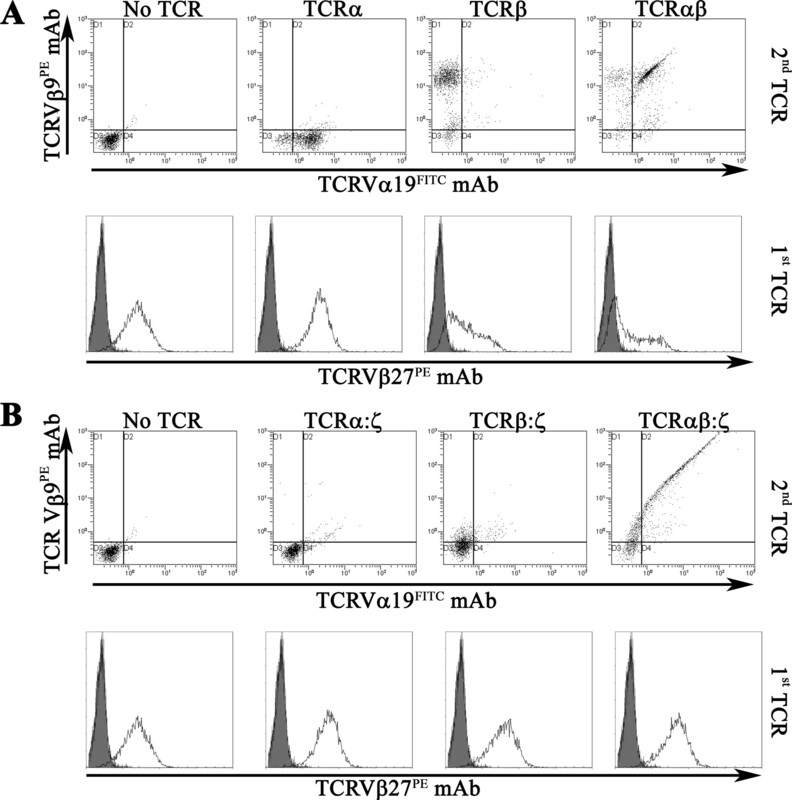 As a measure of correct TCR pairing T cells were stained either with (A) Cy5-labeled anti-TCR Vα19 and Cy3-labeled anti-TCR Vβ9 mAbs, or (B) Cy3-labeled anti-TCR Vα19 and Cy5-labeled anti-TCR Vβ9 mAbs, whereas as a measure of TCR mispairing T cells were stained with (C) Cy5-labeled anti-TCR Vα19 and PE-labeled anti-TCR Vβ27 mAbs. 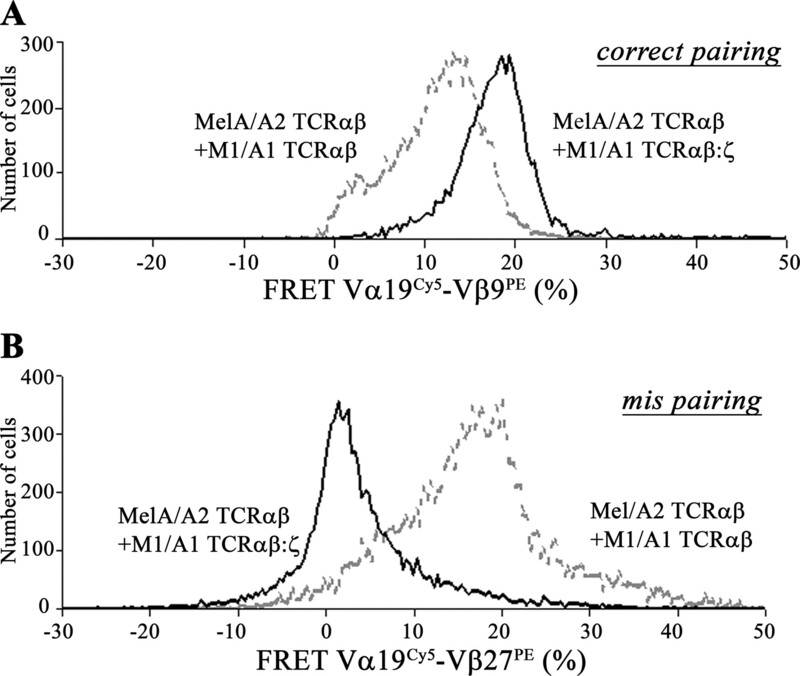 Please note that FRET measurements between M1/A1 and MelA/A2 TCR chains were limited to donor-labeled TCRβ and acceptor-labeled TCRα chain due to lack of Cy5 (donor) labeled TCR-Vβ27 Ab. Also, single M1/A1 TCR T cells (not transduced with MelA/A2 TCR) were not exposed to FRET measurements with Cy5-labeled anti-TCR Vα19 and PE-labeled anti-TCR Vβ27 mAbs. TCRα was stained indirectly, whereas TCRβ was stained directly (see Materials and Methods for details). The bars represent mean FRET values ± SEM of three independent measurements. ∗, A statistically significant difference between TCRαβ:ζ and TCRαβ based on Student's t test (p < 0.01). Genetic introduction of TCRαβ:ζ but not TCRαβ induces a homogenous distribution of FRET values between corresponding as well as noncorresponding TCRα and β chains in dual TCR T cells. Jurkat T cells expressing either M1/A1 TCRαβ (dotted gray line) or TCRαβ:ζ (black line) in the presence of MelA/A2 TCRαβ, previously enriched by FACS using anti-TCR-Vα19 and Vβ9 mAbs, were stained with donor- and acceptor-conjugated anti-TCRα and β Abs and analyzed for FRET efficiency using a FACSCalibur dual-laser flow cytometer as described in Materials and Methods. T cells were stained either with (A) Cy5-labeled anti-TCR Vα19 and PE-labeled anti-TCR Vβ9 mAbs (as a measure of correct TCR pairing), or (B) Cy5-labeled anti-TCR Vα19 and PE-labeled anti-TCR Vβ27 mAbs (as a measure of TCR mispairing). Histograms represent the distribution of FRET values on a cell-by-cell basis from one of two experiments with similar results. TCRαβ:ζ assembly and surface expression is independent of endogenous CD3γ, CD3δ and CD3ε. A, M1/A1 TCRαβ or TCRαβ:ζ are introduced in either TCR-negative Jurkat T cells (nos. 1 and 2, respectively) or Jurkat T cell that already express a MelA/A2 TCRαβ (nos. 3 and 4, respectively). TCR-transduced Jurkat T cells were enriched by FACS using anti-TCR-Vα19 and TCRVβ9 mAbs (specific for M1/A1 TCR). 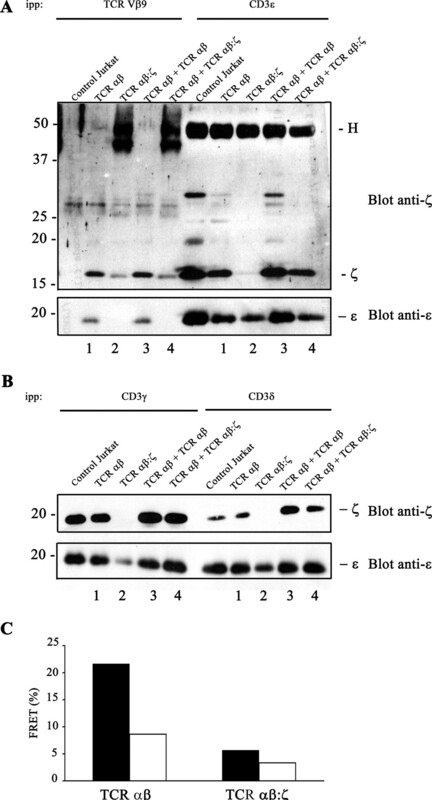 Cells were lysed in Brij96 and IP with one of the following Abs (A) BL37.2 (TCR-Vβ9), OKT3 (CD3ε-containing dimers) and (B) HMT 3.2 (CD3γ) and APA 1.2 (CD3δ). Immunoprecipitates were subjected to 7–17% SDS-PAGE, transferred to nitrocellulose and immunoblotted with either anti-CD3ε mAb (M20) or anti-CD3ζ Ab 448. H, indicates Ig H chain. ∗, The presence of TCRαβ:ζ. This blot represents one of two independent experiments with similar results. C, TCR-negative Jurkat T were transduced with M1/A1 TCRαβ or TCRαβ:ζ and enriched by FACS using anti-TCR-Vα19 and TCRVβ9 mAbs. T cells were double-stained either with Cy3-labeled anti-TCR Vβ9 (BL37.2) and Cy5-labeled anti-CD3ε (OKT3) (▪) or Cy3-labeled anti-CD3ε and Cy5-labeled anti-TCR Vβ9 (□) and analyzed for FRET efficiency by flow cytometry as described in the legend to Fig. 5. FRET values represent one of two independent experiments with similar results. TCRαβ:ζ mediates potent NFAT activation and does not compromise activation of NFAT mediated by an already present TCRαβ in dual TCR T cells. The following Jurkat T cells were nucleofected with an NFAT reporter and β-galactosidase construct as described in Materials and Methods: TCR-negative T cells (□); single TCR T cells expressing either MelA/A2 TCRαβ (▪), M1/A1 TCRαβ (▨) or M1/A1 TCRαβ:ζ (▦); and dual TCR T cells expressing either MelA/A2 TCRαβ and M1/A1 TCRαβ (▤) or MelA/A2 TCRαβ and M1/A1 TCRαβ:ζ (▩). Jurkat T cells were enriched by FACS using anti-TCR-Vα19 and TCRVβ9 mAbs before NFAT reporter assays. T cells were stimulated for 6 h with either anti-TCR Vβ9, Vβ27 or irrelevant Abs. Luciferase activities were determined in cell lysates, normalized for β-galactosidase activities, and expressed relative to a nonstimulated condition (i.e., medium only: RLU = 0.04 in presented experiment and is set to 1.0). The bars represent mean RLU values ± SEM of three independent measurements. Numbers above bars indicate the average fold difference between NFAT activation downstream of TCRαβ:ζ vs TCRαβ. TCRαβ:ζ mediates Ag-specific functions to a comparable extent as TCRαβ in primary human T cells. The HLA-A1-restricted and MAGE-A1-specific cytolytic capacity of M1/A1 TCRαβ:ζ and M1/A1 TCRαβ-positive T cells was analyzed in 4-h 51Cr-release assays, using M1/A1-positive MZ2-MEL3.0 melanoma cells as target cells. CTL 82/30 and mock-transduced lymphocytes were used as positive and negative controls, respectively. M1-negative/A1-positive tumor target cells were not killed by any effector T cells (data not shown). Results from one representative experiment (of three) are shown. a Jurkat T cells were stained for endogenous TCR (i.e. MelA/A2 TCR as a first TCR) with the corresponding anti-TCR-Vβ mAb (i.e., anti-TCR-Vβ27) or exogenous TCR (i.e. 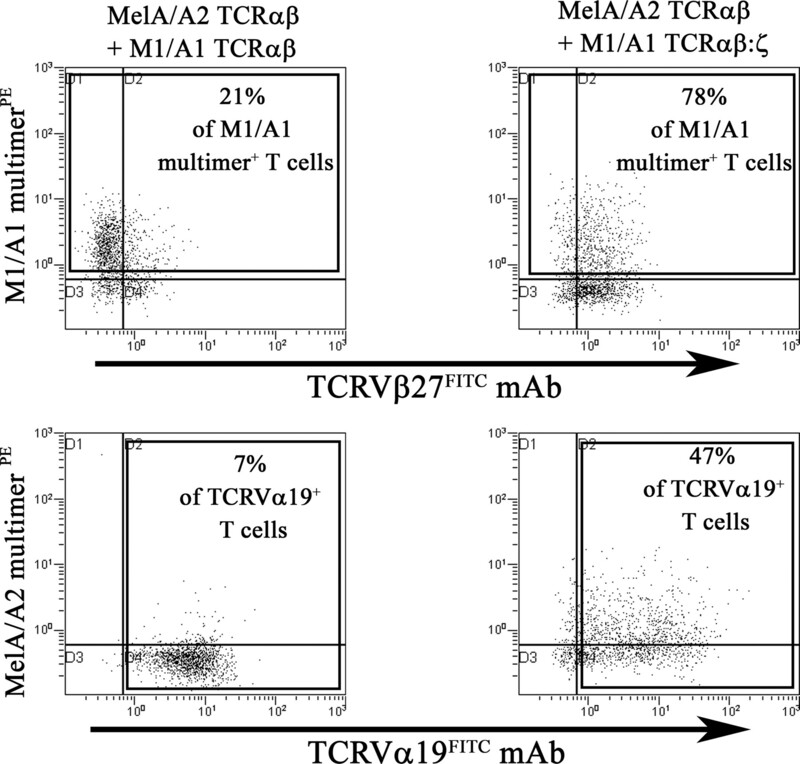 M1/A1 TCR as second TCR) either with the corresponding anti-TCR-Vα mAb (i.e., anti-TCR-Vα19) or anti-TCR-Vβ mAb (i.e., anti-TCR-Vβ9) and analyzed by flow cytometry. Data represent MFI values of one of three independent experiments with similar results. a Jurkat T cells were stained for aendogenous TCR (i.e., MelA/A2 TCR as a first TCR) or b exogenous TCR (i.e. M1/A1, gp100/A2, or EBNA4/A11 TCRs as second TCRs) either with the corresponding anti-TCR-Vβ mAb (i.e., anti-TCR-Vβ27, Vβ9, Vβ12, or Vβ2 mAbs for MelA/A2, M1/A1, gp100/A2, and EBNA4/A11 TCRs, respectively) or pMHC multimers and analyzed by flow cytometry. Data represent MFI values of one of three independent experiments with similar results.